Each month, some friends and I get together for dinner. We rotate who hosts so that no one is required to cook all the time. This tradition has been going on for about eight or nine years at this point. Over time, it is fairly easy to figure out what favorites are. In this case, I know Nate loves banana bread. So if it resembles banana bread, he is in. Amy, is not the biggest fan of sugary treats and instead prefers thinks like fruit. Now Amy is dairy and egg free, and I am dairy and wheat free. This adds a bit more complication to the menu. These cookies, however, meet all the requirements and the preferences. As the cookies require no sugar, they are not too sweet (though if you like a little extra sweetness you can add some brown sugar). Double bonus, the banana is an egg replacer naturally. The cookies are vegan by nature (if you use vegan chocolate chips, which I don’t always depending is what is on sale), so that means we don’t have to try and avoid eggs or diary. You can use regular flour if you are not wheat or gluten sensitive but start with half the dairy-free milk as regular flour tends to need last moisture. You could use melted butter (vegan or otherwise) but I find that I like the coconut oil better. The big secret in this recipe is the previously frozen bananas. I find that the texture is better banana that hasn’t been frozen. The freezing breaks down the banana into a semi-liquid and allows it to mix in better without chunks. If you don’t have frozen bananas, you can microwave slightly-over ripe bananas (but freezing is better – and it keeps you from throwing them out if you aren’t ready for cookies!). Preheat oven to 350 degrees Fahrenheit and prepare a baking sheet with non-stick spray. 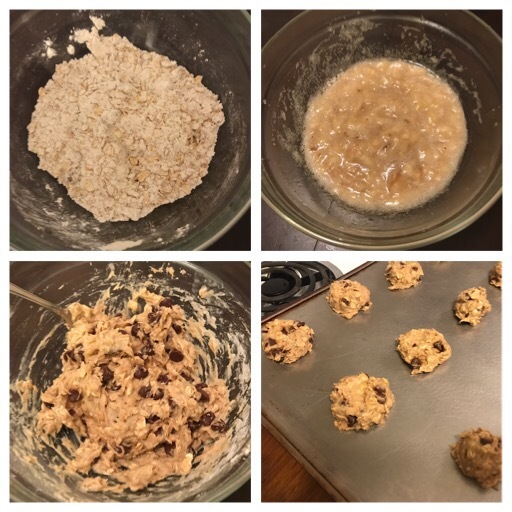 Combine flour, oats, baking powder, and salt. In a second, smaller bowl combine mashed banana, melted coconut oil, and non-dairy milk. Fold the wet ingredients into the dry ingredients. The batter will be thick and sticky when combined. If it is too dry, add more diary-free milk and fold again. Add the chocolate chips, and fold in again. Using a small ice cream scoop, portion out the mixture onto the baking sheet (about 12 cookies) – I use rows of four by three so they all fit onto one sheet. You can crowd the pan as the cookies do not melt down as they cook. If you want fluffier, bready cookies then leave the scoops rounded. For a more cookie-shaped dessert with a slightly denser texture, use the back of a spoon to press the dough into ½” high rounds. Bake for 12-14 minutes. Remove from the oven and let cool for at least 5 minutes before serving. Best if served same day, but can be stored for two days in an airtight container. If you are adding in the brown sugar (for a sweeter cookie) or the cinnamon/pumpkin pie spice, add to the dry ingredients. If you are adding the vanilla, add to the wet mixture. Either way, follow the remaining steps as detailed above.